I was last at Station 885 in Plymouth for my college graduation dinner over 10 years ago. Recently on the Detroit Groupon website, they had a deal to get a $35 gift certificate for $15 for this restaurant that I couldn’t pass up. We went for lunch this past weekend. They were short a hostess so we had to flag down a waitress to get seated, but the rest of the visit went fine. The waitress we had was very enthusiastic about the menu and had several suggestions for what to order. When the server is that candid and sincere, you know you’ve come to the right place. 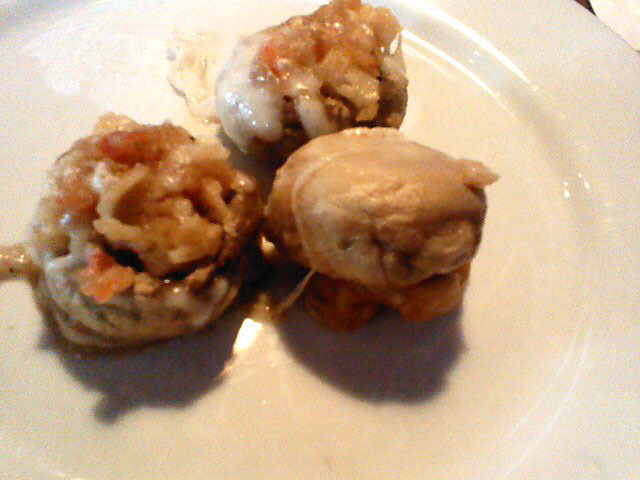 We started with an appetizer of crab stuffed mushrooms. They were amazing! 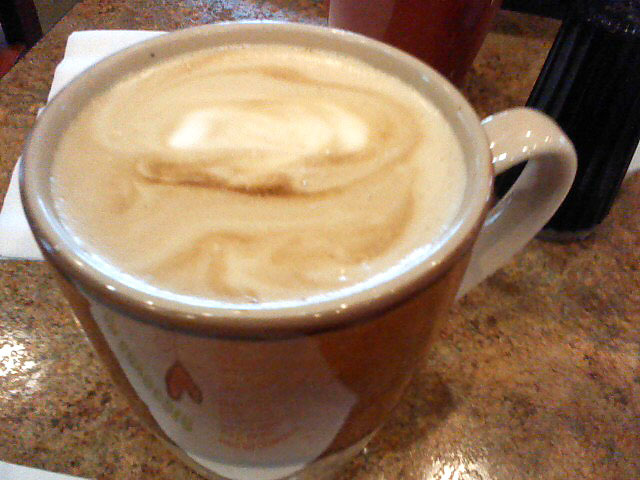 I will have to come back for this alone on a regular basis. Trust me, the picture does not do the dish justice. The mushrooms are come with a slice of fresh lemon on the side to squeeze over top. 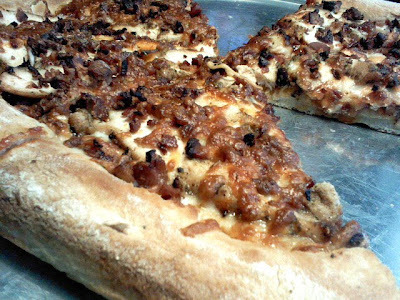 The crab is fresh and the cheese is gooey and flavorful. I believe six mushrooms came in an order for $6.99, not bad. 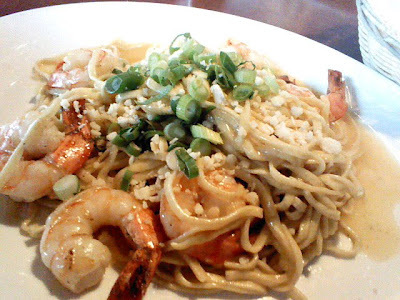 I ordered the shrimp scampi pasta which included a choice of salad or soup and fresh bread. 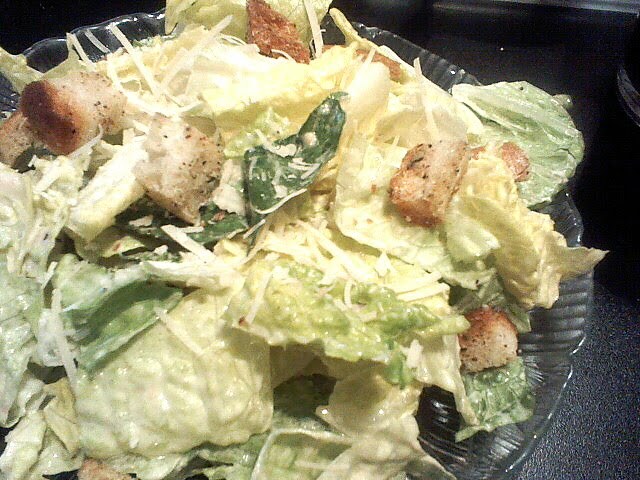 I went with the garden salad and a side of balsamic vinaigrette. The salad was a simple blend of mixed field greens and grape tomatoes. 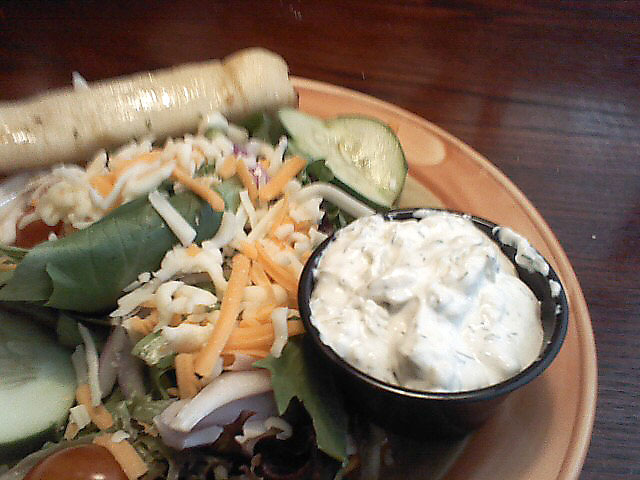 The balsamic dressing was well balanced. 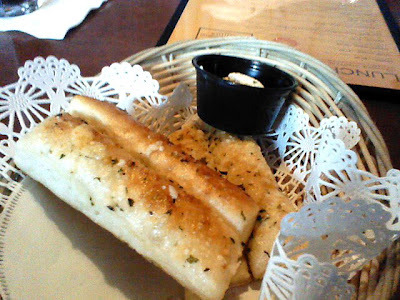 The fresh garlic cheese bread that accompanied the meal was addictive! I wasn’t expecting much, but kept going back for more and had to push the rest onto my husband for risk of overdoing it. Great garlic flavor with herbs and cheese. It came with a side of butter that was unnecessary because the bread was already rich with it. After great food leading up to the entree I was really excited to see what the main dish had to offer. Unfortunately, my choice fell a bit short compared to the rest of the meal. The linguine itself was quite good, I even asked if they made it in house because it tasted so fresh; it’s not made in-house. However, it was sticking together and would have been more appealing if that wasn’t the case. The shrimp were a bit overcooked, but as garlicky as a good scampi should be. The scallions on top were a nice visual presentation and added a bit more flavor interest. My husband was also a bit underwhelmed by his dish — prime rib over Texas toast with a side of horseradish and fries. Although, he was very appreciative of the server’s suggestion to add sauteed mushrooms when he opted out of the caramelized onions. 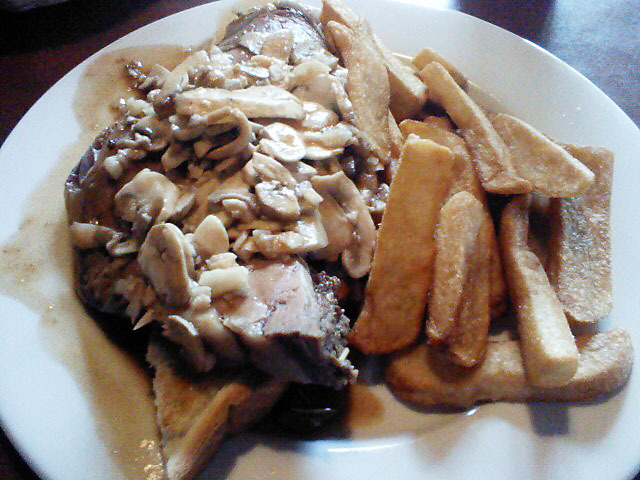 The meat was lacking on flavor and the mushrooms could have been cooked a bit more. The fries were fine, but standard. It certainly won’t take me ten years to go back after this mostly positive experience. Prices are very reasonable and the staff is full of zeal. Plus, I’ll have to put in for a double order of those crab stuffed mushrooms! If Station 885 can bring the quality and flavor of their main dishes up to those preceding meal they’ll be in excellent shape. I returned to Decadent Delight in Ann Arbor this past weekend with their creme brulee fruit tart on my mind. I’ve reviewed the tart before and it’s fantastic. 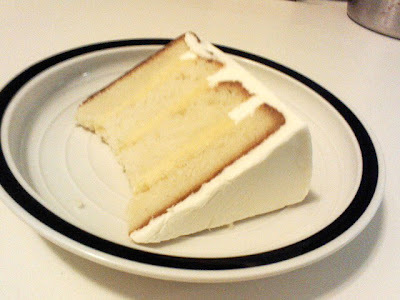 After walking in the door I had to add to my order when I found they were selling slices of vanilla cake with creme brulee filling and a vanilla buttercream frosting. I’ve heard a number of people make the comment that vanilla is such a plain and boring flavor. I highly disagree. Vanilla can be very interesting and complex and comes from the exotic orchid plant (what’s boring about that?). Wow! The cake was really good… the vanilla cake tasted like a rich pound cake, the brulee filling was rich and delicious and the buttercream was decadent (no pun intended). My heart felt like a ring of butter was surrounding it after the last bite, but worth the taste experience. I’ve been wanting to try Logan in Ann Arbor for a number of years and I finally got my chance a couple of weeks ago on a Friday. I love high end restaurants that offer lunch during the week, so those of us on a budget can still afford great taste. Logan offers lunch only Monday thru Friday, but the do have a few affordable choices on the dinner menu as well, though most dinner entrees average around $25-$30. Most sandwiches on the lunch menu are under $10 and lunch portion entrees run between $10-$14, not bad. 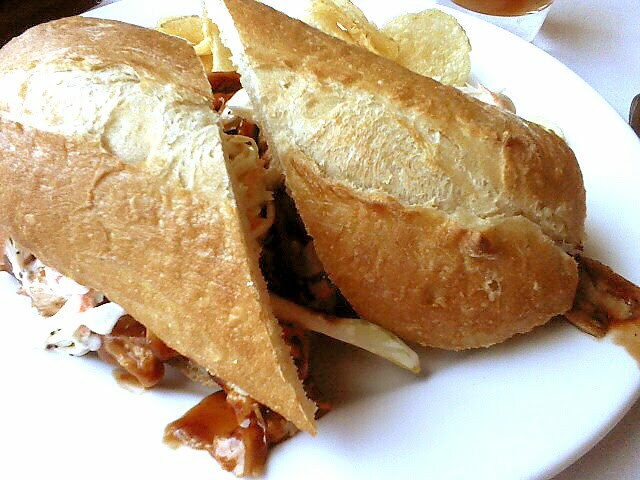 On this visit I tried their Pulled BBQ Chicken sandwich — oven roasted chicken mixed with a sweet BBQ sauce, topped with coleslaw and served on a crusty baguette. I love good barbecue, but I wasn’t sure what to expect from a non-barbecue, more sophisticated restaurant. 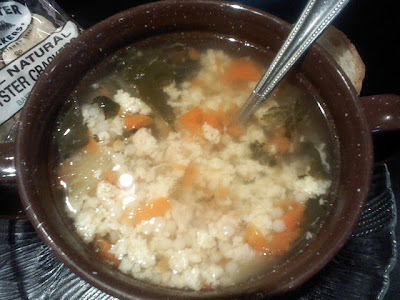 It was terribly messy, but really good; I would have loved some wet-naps. The sauce was sweet and there was plenty of it. I’m not always a fan of coleslaw on my sandwich, I usually like it best on the side, but this was a treat. 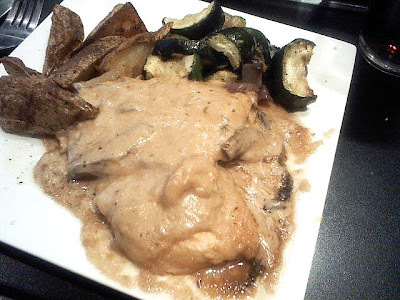 It was a creamy and a delicious addition to the the other textures in the meal. The bread was fantastic; they must bake it in house or get it fresh each day from a bakery. The texture and flavors of the bread’s crust were what kept me coming back for more, even when I was getting full. The house made potato chips served along side were quite tasty too, and I’m not much of a potato chip fan, so I really do mean it. I had thought about dessert, but because service was a bit slow and inattentive this time, we decided to pass. The waiter was friendly when he was available, but we had to wait about 10 minutes after we sat down to get our drink order taken. Our drinks were never refilled during the visit, though he did finally ask me about a refill when I was paying the bill; which was also the only time we were asked how are meal was. All in all, I ‘d give it another shot in the future. I’m not sure if lunch there is more leisurely and that’s why service was a little lacking, or if our age played a factor since the average patron was in their mid-to-late 40s and we fell under that by 10 years. Either way, every customer deserves great service in my opinion, especially at a restaurant that pride’s itself on being higher end. 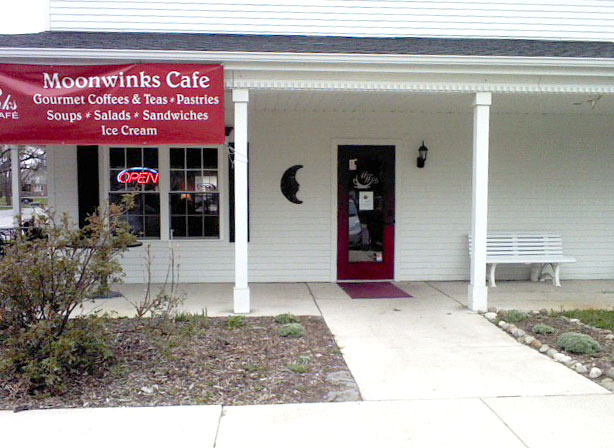 I’m looking forward to more great food, and hopefully improved service on a future visit.